/BigMIND /Cold Storage /How can I add files or folders to the Cold storage? Right click Zoolz agent (icon) on the system tray (Taskbar) of the machine where Zoolz software is installed → Select the Open dashboard option. Click on Data selections and select the data that you want to backup. The Cold storage is the only type of storage available for the Zoolz Home users. Refer to the Cold storage tab and add the path(s) of the file(s) or folder(s) that you want to backup to the Cold Storage. Create or edit the existing policy. Add the paths of the files or the folders that you want to backup from the Cold Storage Data tab, and save your changes. 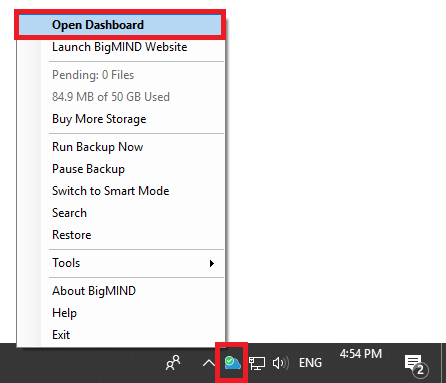 Right click BigMIND agent (icon) on the system tray (Taskbar) of the machine where BigMIND software is installed → Select the Open dashboard option. 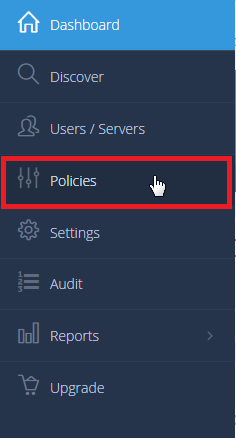 From the left side menu, select the Policies option.